Regulation (EU) No 1286/2014 introduces a new standardised key information document to improve the retail investor's understanding of packaged retail and insurance-based investment products (‘PRIIPs’) and the comparability of those products. In order to provide retail investors with key information that is easy to read, understand and compare, a common template should be established for the key information document. The identity and contact details mentioned in Article 8(3)(a) of Regulation (EU) No 1286/2014 should include the International Securities Identification Number or Unique Product Identifier for the PRIIP, where that identifier is available, in order to make it easier for the retail investor to find additional information about the PRIIP. In order to ensure that retail investors understand and compare the economic and legal features of the PRIIP, as well as to provide them with an appropriate overview of the investment policy and strategy of the PRIIP, the key information document should contain standardised information concerning the type of the PRIIP, its investment objectives and how they will be achieved and the key features or aspects of the product, such as the insurance coverage. The information provided to retail investors should enable those investors to understand and compare the risks associated with investments in PRIIPs so that they can make informed investment decisions. The risks pertaining to a PRIIP can vary. The most important risks are market risk, credit risk and liquidity risk. In order for retail investors to fully understand those risks, information on the risks should be aggregated as far as possible and numerically presented as a single summary risk indicator with sufficient narrative explanations. When assessing credit risk, PRIIP manufacturers should take into account certain factors that may mitigate credit risk for a retail investor. In this respect, where assessing whether assets of a PRIIP or appropriate collateral, or assets backing the payment obligations of a PRIIP, are at all times until maturity equivalent to the payment obligations of the PRIIP to its investors, such assessment should reflect that the assets held by an insurance undertaking correspond at any time to the current amount that the insurance undertaking would have to pay to transfer its obligations in respect of the PRIIP to another insurance undertaking. Currently, ratings of External Credit Assessment Institutions (ECAIs) provide a consistent proxy for credit risk across different Union sectors. The reliance on credit ratings is, however, to be reduced wherever possible. Therefore, it is important that the summary risk indicator is objectively accurate and ensures comparability between different PRIIPs and that it is appropriately monitored with regard to market risk and credit risk, so that evidence on the effectiveness of the risk measurement in practice can be made available for the review of Regulation (EU) No 1286/2014 foreseen by 31 December 2018. The review should take into account the extent to which ECAI ratings in practice reflect the creditworthiness of the PRIIP manufacturer and credit risk faced by investors in individual PRIIPs. Where there is a risk that the liquidity of a PRIIP might vary in light of the opportunities to exit the PRIIP early or to find a buyer on a secondary market, a specific warning should be provided. That warning should also include the circumstances under which there is a risk that pay outs from the PRIIP may be significantly different than expected for early exits, including through the application of exit penalties. While estimates on returns from a PRIIP are difficult to produce and understand, information on such estimates are of primary interest for retail investors and should be included in the key information document. Retail investors should be provided with clear information on return estimates that is consistent with realistic assumptions about possible outcomes and with the estimates of the PRIIPs' level of market risk, presented in such a way so as to make clear the uncertainty of that information and the fact that better or worse outcomes are possible. In order for retail investors to be able to appreciate the risk, the key information document should provide retail investors with information as to potential consequences where a PRIIP manufacturer is not able to pay out. The degree of protection of the retail investor in such cases under investment, insurance or deposit guarantee schemes should be clearly set out. Information on costs is important for retail investors when comparing different PRIIPs, which can have different cost structures, and when considering how the cost structure of a particular PRIIP might apply to them, which depends on how long they are invested, how much they invest, and how well the PRIIP performs. For this reason, the key information document should contain information that allows the retail investor to compare the overall total cost levels between different PRIIPs when held for their recommended holding periods and shorter periods, and to understand how these costs might vary and evolve over time. Consumer testing research has shown that retail investors can understand monetary figures more readily than percentages. Small differences in costs expressed in percentages may correlate with large differences in the costs borne by the retail investor when expressed in monetary terms. For this reason, the key information document should also provide the total costs for the recommended holding periods and shorter periods, both in monetary terms and as a percentage. Given that the impact of different kinds of cost on returns can vary the key information document should also provide a breakdown of the different kinds of costs. The breakdown of costs should be expressed in standardised terms and as a percentage so that the amounts for different PRIIPs can be easily compared. Retail investors may experience a change in personal circumstances where longer term investments unexpectedly need to be disinvested. Disinvestments due to market developments may also be necessary. Given the difficulties for retail investors to anticipate the degree of liquidity they may need in their investment portfolios as a whole, information on recommended holding periods and required minimum holding periods, and the possibility of partial or complete early exit, is particularly important and should be included in the key information document. For the same reasons, the availability and consequences of such early disinvestment should be made clear. Specifically, it should be clear whether such consequences are due to explicit fees, penalties or limitations on disinvestment rights, or to the fact that the value of the particular PRIIP to be disinvested is particularly sensitive to the timing of the disinvestment. Given that the key information document is also likely to be used as a summary of the main features of the PRIIP by retail investors, it should contain clear information on how a complaint might be lodged about the product or about the conduct of the PRIIP manufacturer or a person advising on, or selling, the product. Some retail investors may wish to obtain further information on specific aspects of the PRIIP. The key information document should therefore include a clear and specific cross-reference to where further specific information can be found, where such information is to be included in the key information document pursuant to Regulation (EU) No 1286/2014. Where the PRIIP manufacturer is obliged to disclose certain other information according to national or Union law, the retail investor should be informed of this fact and of how to obtain those other documents, even if they are only to be provided on request. In view of ensuring that the key information document is as concise as possible, links to those other documents may be provided by means of a website, as long as their existence is made clear and they can be accessed by means of that website. A key information document for a PRIIP that offers many underlying investment options cannot be provided in the same format as a key information document for another PRIIP, since each underlying investment option will have a specific risk, performance and cost profile, which prevents all necessary information to be provided in a single, concise stand-alone document. The underlying investment options may be investments in PRIIPs or other investments of a similar nature, or standardised portfolios of underlying investments. Those underlying investment options can have different risks, rewards and costs. Depending on the nature and number of underlying investment options, the PRIIP manufacturer should therefore, if he deems it appropriate, be able to prepare individual key information documents for each option. Those key information documents should also contain generic information about the PRIIP. Where individual key information documents for each option are deemed not appropriate for retail investors by the PRIIP manufacturer, specific information about the underlying investment options and the generic information about the PRIIP, should be provided, separately. To avoid confusion, the generic information about the PRIIP provided in the key information document should indicate the range of risks, performance and costs that can be expected across the different underlying investment options offered. In addition, the specific information on the underlying investment options should always reflect the features of the PRIIP through which the underlying investment options are offered. This specific information may be provided in different forms, for example in the form of single document setting out the necessary information on all the different underlying investment options, or through individual documents for each underlying investment option. UCITS and non-UCITS funds to which Articles 78 to 81 of Directive 2009/65/EC of the European Parliament and of the Council (2) apply with regard to the format and content of their key investor information document are afforded a transitional exemption period under Regulation (EU) No 1286/2014. In order to provide those funds with a consistent transitional legal regime, PRIIP manufacturers should be allowed to continue using those key investor information documents in respect of PRIIPs offering those types of funds as the only underlying investment options, or alongside other underlying investment options. Where PRIIP manufacturers opt to use the key investor information documents in case of PRIIPs offering those types of funds alongside other investment options, the generic key information document should show a single range of risk classes in the format of the PRIIPs risk scale. The range of risk classes for all underlying investment options offered within the given PRIIP should combine synthetic risk and reward indicator pursuant to Article 8 of Commission Regulation (EU) No 583/2010 (3) for the UCITS or non-UCITS funds and summary risk indicator in accordance with this Regulation for other underlying investment options. Where the PRIIP offers only UCITS or non-UCITS funds as investment options, the PRIIP manufacturer should be allowed to use the presentation and methodology pursuant to Article 10 of Regulation (EU) No 583/2010. Regardless of the form chosen, the specific information should always be consistent with the information that is contained in the key information document. PRIIP manufacturers must prepare key information documents that are accurate, fair, clear and not misleading. The information contained in the document should be capable of being relied on by a retail investor when making an investment decision, even in the months and years following the initial preparation of the key information document, for those PRIIPs that remain available to retail investors. Standards should therefore be laid down to ensure timely and appropriate review and revision of key information documents, so that those documents remain accurate, fair and clear. Data that is used for preparing the information contained in the key information document, such as data on costs, risks and performance scenarios, may change over time. Changing data can lead to changes in the information to be included, such as a change in the risk or costs indicators. For this reason, PRIIP manufacturers should establish periodic processes to review the information contained in the key information document. Those processes should include an assessment of whether changes in the data would necessitate a revision and republication of the document. The approach by PRIIP manufactures should reflect the extent to which the information to be included in the key information document changes, for instance for an exchange-traded derivative, such as a standardised future, call or put, there should be no necessity to continuously update the key information document as the information required for these instruments on their risks, rewards and costs would not fluctuate. Periodic reviews may not be sufficient in cases where the PRIIP manufacturer becomes aware or should have become aware of changes outside the periodic review process that may significantly impact the information contained in the key information document, such as changes to a previously disclosed PRIIP investment policy or strategy that would be significant for retail investors, or significant changes to the cost structure or risk profile. For this reason, PRIIP manufacturers should also be required to establish processes for identifying situations where the information contained in the key information document should be reviewed and revised on an ad hoc basis. Where a periodic or ad hoc review of a key information document identifies changes to the information that is required to be included in the document, or concludes that information contained in the key information document is no longer accurate, fair, clear and not misleading, the PRIIP manufacturer should be required to revise the key information document to take that changed information into account. Given that changes may be relevant for retail investors and their future allocation of investment assets, retail investors should be able to easily locate the new key information document, which should therefore be published, and be clearly identifiable, on the website of the PRIIP manufacturer. Where possible, the PRIIP manufacturer should inform retail investors when the key investor documents have been revised, for example by means of mailing lists or email alerts. In order to ensure that the timing of the delivery of key information documents is approached in a consistent way across the Union, PRIIP manufacturers should be required to provide the key information document in good time before those retail investors are bound by any contract or offer relating to that PRIIP. The key information document should be made available to retail investors sufficiently prior to their investment decision, so that they are able to understand and take into account the relevant PRIIP information when making that decision. Since the investment decision is made prior to the commencement of any mandatory cooling off period, the key information document should be provided prior to such a cooling off period. While in all cases retail investors should receive the key information document in good time before they are bound by any contract or offer related to the PRIIP, what might be considered sufficient time for a retail investor to understand and take into account the information may vary, given that different retail investors have different needs, experience and knowledge. The person advising on, or selling, a PRIIP should therefore take into account such factors in relation to individual retail investors when determining the time that those retail investors will need to consider the contents of the key information document. In order to make an informed investment decision, a retail investor may need additional time to consider the key information document of a complex PRIIP or a PRIIP that is unknown to that investor. Accordingly, such factors should be taken into account when considering what amounts to the provision of the key information document in good time. The urgency of the situation, for instance where it is important for a retail investor to buy a PRIIP at a given price and the price is sensitive to the timing of the transaction, should also be considered when determining the extent of the good time criterion. For reasons of consistency and in order to ensure the smooth functioning of the financial markets, it is necessary that the provisions of this Regulation and the provisions laid down in Regulation (EU) No 1286/2014 apply from the same date. This Regulation is based on the draft regulatory technical standards submitted to the Commission by the European Banking Authority, the European Insurance and Occupational Pensions Authority and the European Securities and Markets Authority (the ‘European Supervisory Authorities’). the date of production or, where the key information document has been subsequently revised, the date of the latest revision of the key information document. 1. Information relating to the type of the PRIIP in the section entitled ‘What is this product?’ of the key information document shall describe its legal form. 2. Information stating the objectives of the PRIIP and the means for achieving those objectives in the section entitled ‘What is this product?’ of the key information document shall be summarised in a brief, clear and easily understandable manner. That information shall identify the main factors upon which return depends, the underlying investment assets or reference values, and how the return is determined, as well as the relationship between the PRIIP's return and that of the underlying investment assets or reference values. That information shall reflect the relationship between the recommended holding period and the risk and reward profile of the PRIIP. Where the number of assets or reference values referred to in the first subparagraph is such that specific references to all of them cannot be provided within a key information document, only the market segments or instrument types in respect of the underlying investment assets or reference values shall be identified. 3. 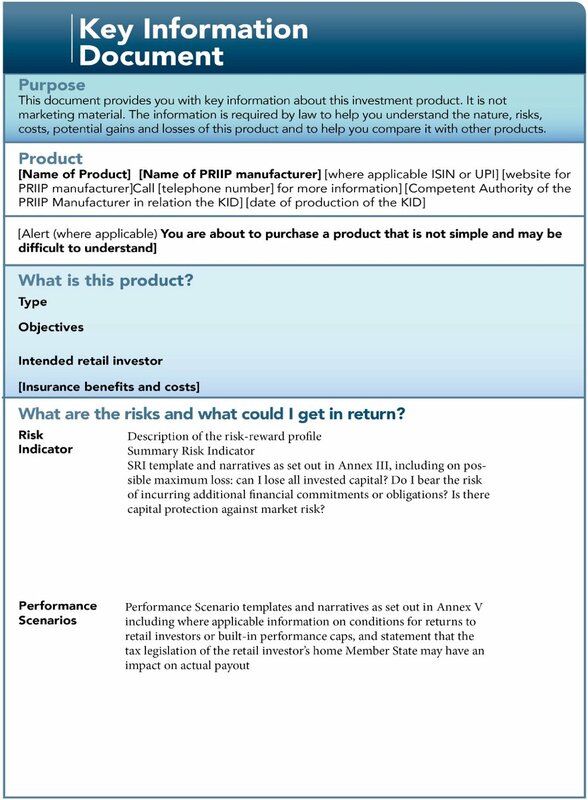 The description of the type of retail investor to whom the PRIIP is intended to be marketed in the section entitled ‘What is this product?’ of the key information document shall include information on the target retail investors identified by the PRIIP manufacturer, in particular depending on the needs, characteristics and objectives of the type of client for whom the PRIIPs is compatible. This determination shall be based upon the ability of retail investors to bear investment loss and their investment horizon preferences, their theoretical knowledge of, and past experience with PRIIPs, the financial markets as well as the needs, characteristics and objectives of potential end clients. 4. The details of insurance benefits in the section entitled ‘What is this product?’ of the key information document shall include in a general summary, namely, the key features of the insurance contract, a definition of each benefit included, with an explanatory statement indicating that the value of those benefits is shown in the section entitled ‘What are the risks and what I could get in return’ and information which reflects the typical biometric characteristics of the target retail investors, showing the overall premium, the biometric risk premium that forms part of that overall premium and either the impact of the biometric risk premium on the investment return at the end of the recommended holding period or the impact of the cost part of the biometric risk premium taken into account in the recurring costs of the ‘Costs over the time table’ calculated in accordance with Annex VII. Where the premium is paid in the form of a single lump sum, the details shall include the amount invested. Where the premium is paid periodically, the number of periodic payments, an estimation of the average biometric risk premium as a percentage of the annual premium, and an estimation of the average amount invested shall be included in the information. The details referred to in the first subparagraph shall also include an explanation of the impact of the insurance premium payments, equivalent to the estimated value of insurance benefits, on the returns of the investment for the retail investor. a description of the circumstances under which the PRIIP can be automatically terminated, and the termination dates, if known. 1. In the section entitled ‘What are the risks and what could I get in return?’ of the key information document, PRIIP manufacturers shall apply the methodology for the presentation of risk as set out in Annex II, include the technical aspects for the presentation of the summary risk indicator as set out in Annex III and comply with the technical guidance, the formats and the methodology for the presentation of performance scenarios, as set out in Annexes IV and V.
an indication of the possible maximum loss, and information that the investment may be lost if it is not protected or where the PRIIP manufacturer is unable to pay out, or that necessary additional investment payments to the initial investment may be required and that the total loss may significantly exceed the total initial investment. 3. PRIIP manufacturers shall include four appropriate performance scenarios, as set out in Annex V in the section entitled ‘What are the risks and what could I get in return?’ of the key information document. Those four performance scenarios shall represent a stress scenario, an unfavourable scenario, a moderate scenario and a favourable scenario. 4. 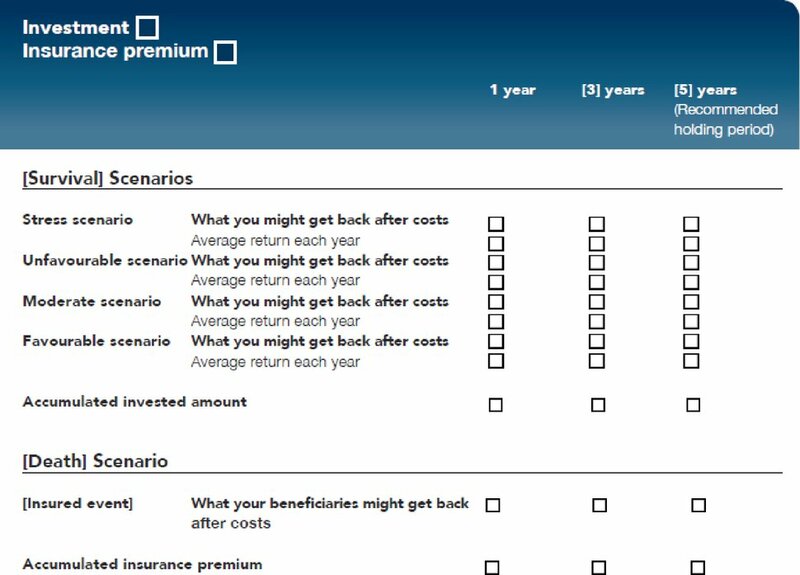 For insurance-based investment products, an additional performance scenario shall be included in the section entitled ‘What are the risks and what could I get in return?’ of the key information document reflecting the insurance benefit the beneficiary receives where a covered insured event occurs. 5. For PRIIPs that are futures, call options and put options traded on a regulated market or on a third-country market considered to be equivalent to a regulated market in accordance with Article 28 of Regulation (EU) No 600/2014 of the European Parliament and of the Council (9), performance scenarios shall be included in the form of pay-off structure graphs as set out in Annex V in the section entitled ‘What are the risks and what could I get in return?’ of the key information document. a clarification whether the loss referred to in point (a) is covered by an investor compensation or guarantee scheme, and whether there are any limitations or conditions to that cover. the ‘Costs over time’ and ‘Composition of costs’ tables to information on costs, as set out in Annex VII in accordance with the relevant technical guidance therein. 2. 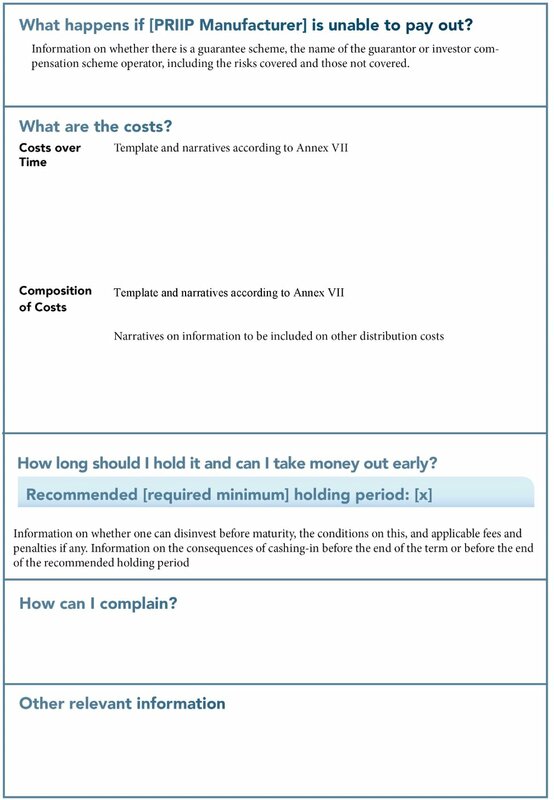 In the ‘Costs over time’ table in the section entitled ‘What are the costs?’ of the key information document, PRIIP manufacturers shall specify the summary cost indicator of the total aggregated costs of the PRIIP as a single number in monetary and percentage terms for the different time periods set out in Annex VI. any incidental costs, such as performance fees or carried interest, presented in percentage terms. 4. 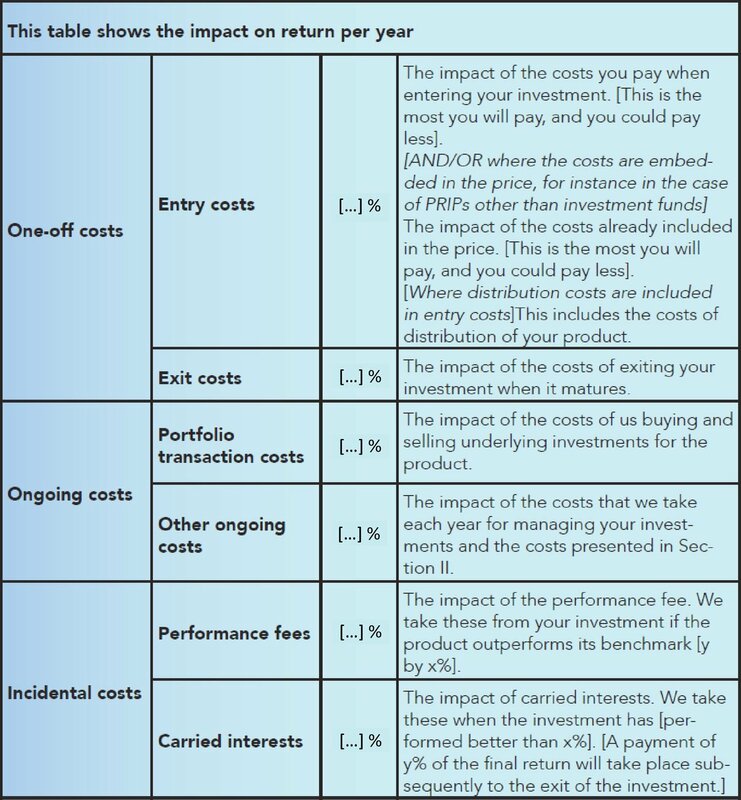 PRIIP manufacturers shall insert a description of each of the different costs included in the ‘Composition of costs’ table in the section entitled ‘What are the costs?’ of the key information document, specifying where and how such costs may differ from the actual costs the retail investor may incur or may depend on the retail investor choosing to exercise or not exercise certain options. information about any fees and penalties which are incurred for disinvestments prior to maturity or any other specified date other than the recommended holding period, including a cross reference to the information on costs to be included in the key information document pursuant to Article 5 and a clarification of the impact of such fees and penalties for different holding periods. an up-to-date postal address and an email address to which such complaints may be submitted. 1. PRIIP manufacturers shall indicate in the section entitled ‘Other relevant information’ of the key information document any additional information documents that may be provided, and whether such additional information documents are made available based on a legal requirement or only at the request of the retail investor. 2. The information included in the section entitled ‘Other relevant information’ of the key information document may be provided in summary format, including a link to the website where further details other than the documents referred to in paragraph 1 are made available. PRIIP manufacturers shall present the key information document by means of the template laid down in Annex I. The template shall be completed in accordance with the requirements set out in this Delegated Regulation and in Regulation (EU) No 1286/2014. a generic key information document describing the PRIIP in accordance with Chapter I, unless otherwise specified in Articles 11 to 14.
an indication where the specific information on each underlying investment option is to be found. 2. Where PRIIP manufacturers use the key investor information document in accordance with Article 14(2), for the purposes of specifying the risk classes referred to in point (a) of paragraph 1, they shall use the synthetic risk and reward indicator pursuant to Article 8 of Regulation (EU) No 583/2010 in relation to UCITS or non-UCITS funds as underlying investment options. 2. Notwithstanding the requirements laid down in Article 5(1)(a), and by way of derogation from points 12 to 20 of Annex VI, where PRIIP manufacturers use the key investor information document in accordance with Article 14(2), they may apply the methodology set out in point 21 of Annex VI to existing UCITS or non-UCITS funds. 3. Where PRIIP manufacturers use the key investor information document in accordance with Article 14(2) with UCITS or non-UCITS funds as the only underlying investment options, by way of derogation from Article 5, they may specify the range of charges for the PRIIP in accordance with Article 10 of Regulation (EU) No 583/2010. a presentation of the costs in accordance with Article 5. 2. By way of derogation from paragraph 1, PRIIP manufacturers may use the key investor information document drawn up in accordance with Articles 78 to 81 of Directive 2009/65/EC to provide specific information for the purposes of Articles 11 to 13 of this Delegated Regulation where at least one of the underlying investment option referred to in paragraph 1 is a UCITS or non-UCITS fund referred to in Article 32 of Regulation (EU) No 1286/2014. 1. PRIIP manufacturers shall review the information contained in the key information document every time there is a change that significantly affects or is likely to significantly affect the information contained in the key information document and, at least, every 12 months following the date of the initial publication of the key information document. whether the mean return for the PRIIP's moderate performance scenario, expressed as an annualised percentage return, has changed by more than five percentage points. 3. For the purposes of paragraph 1, PRIIP manufacturers shall establish and maintain adequate processes throughout the life of the PRIIP where it remains available to retail investors to identify without undue delay any circumstances which might result in a change that affects or is likely to affect the accuracy, fairness or clarity of the information contained in the key information document. 1. PRIIP manufacturers shall without undue delay revise the key information document where a review pursuant to Article 15 concludes that changes to the key information document need to be made. 2. PRIIP manufacturers shall ensure that all sections of the key information document affected by such changes are updated. 3. The PRIIP manufacturer shall publish the revised key information document on its website. 1. The person advising on or selling a PRIIP shall provide the key information document sufficiently early so as to allow retail investors enough time to consider the document before being bound by any contract or offer relating to that PRIIP, regardless of whether or not the retail investor is provided with a cooling off period. where the advice or sale is at the initiative of the retail investor, the urgency explicitly expressed by the retail investor of concluding the proposed contract or offer. It shall apply from 1 January 2018. Article 14(2) shall apply until 31 December 2019. Done at Brussels, 8 March 2017. (1) OJ L 352, 9.12.2014, p. 1. (2) Directive 2009/65/EC of the European Parliament and of the Council of 13 July 2009 on the coordination of laws, regulations and administrative provisions relating to undertakings for collective investment in transferable securities (UCITS) (recast) (OJ L 302, 17.11.2009, p. 32). (3) Commission Regulation (EU) No 583/2010 of 1 July 2010 implementing Directive 2009/65/EC of the European Parliament and of the Council as regards key investor information and conditions to be met when providing key investor information or the prospectus in a durable medium other than paper or by means of a website (OJ L 176, 10.7.2010, p. 1). (4) Regulation (EU) No 1093/2010 of the European Parliament and of the Council of 24 November 2010 establishing a European Supervisory Authority (European Banking Authority), amending Decision No 716/2009/EC and repealing Commission Decision 2009/78/EC (OJ L 331, 15.12.2010, p. 12). (5) Regulation (EU) No 1094/2010 of the European Parliament and of the Council of 24 November 2010 establishing a European Supervisory Authority (European Insurance and Occupational Pensions Authority), amending Decision No 716/2009/EC and repealing Commission Decision 2009/79/EC (OJ L 331, 15.12.2010, p. 48). (6) Regulation (EU) No 1095/2010 of the European Parliament and of the Council of 24 November 2010 establishing a European Supervisory Authority (European Securities and Markets Authority), amending Decision No 716/2009/EC and repealing Commission Decision 2009/77/EC (OJ L 331, 15.12.2010, p. 84). (7) Directive (EU) 2016/97 of the European Parliament and of the Council of 20 January 2016 on insurance distribution (OJ L 26, 2.2.2016, p. 19). (8) Directive 2014/65/EU of the European Parliament and of the Council of 15 May 2014 on markets in financial instruments and amending Directive 2002/92/EC and Directive 2011/61/EU (OJ L 173, 12.6.2014, p. 349). (9) Regulation (EU) No 600/2014 of the European Parliament and of the Council of 15 May 2014 on markets in financial instruments and amending Regulation (EU) No 648/2012 (OJ L 173, 12.6.2014, p. 84). PRIIP manufacturers shall comply with the section order and titles set out in the template, which however does not fix parameters regarding the length of individual sections and the placing of page breaks, and is subject to an overall maximum of three sides of A4-sized paper when printed. Market risk is measured by the annualised volatility corresponding to the value-at-risk (VaR) at a confidence level of 97,5 % over the recommended holding period, unless stated otherwise. The VaR is the percentage of the amount invested, that is returned to the retail investor. For the purposes of determining market risk, PRIIPs are divided into four categories. PRIIPs or underlying investments of PRIIPs which are priced on a less regular basis than monthly, or which do not have an appropriate benchmark or proxy, or whose appropriate benchmark or proxy is priced on a less regular basis than monthly. Category 2 covers PRIIPs which, either directly or on a synthetic basis, offer non-leveraged exposure to the prices of underlying investments, or a leveraged exposure on underlying investments that pays a constant multiple of the prices of those underlying investments, where at least 2 years of historical daily prices, or 4 years of historical weekly prices, or 5 years of monthly prices are available for the PRIIP, or where existing appropriate benchmarks or proxies are available, provided that such benchmarks or proxies fulfil the same criteria for the length and frequency of the price history. Category 3 covers PRIIPs whose values reflect the prices of underlying investments, but not as a constant multiple of the prices of those underlying investments, where at least 2 years of daily prices of the underlying assets, 4 years of weekly prices or 5 years of monthly prices, or where existing appropriate benchmarks or proxies are available, provided that such benchmarks or proxies fulfil the same criteria for the length and frequency of the price history. Category 4 covers PRIIPs whose values depend in part on factors not observed in the market, including insurance-based PRIIPs which distribute a portion of the PRIIP manufacturer's profits to retail investors. Where appropriate benchmarks or proxies are used by a PRIIP manufacturer, those benchmarks or proxies shall be representative of the assets or exposures that determine the performance of the PRIIP. The PRIIP manufacturer shall document the use of such benchmarks or proxies. The MRM class for Category 1 PRIIPs shall be 7, with the exception of PRIIPs referred to in point 4(c) of this Annex, where the MRM class shall be 6. The VaR shall be calculated from the moments of the observed distribution of returns of the PRIIP's or its benchmark or proxy's price during the past 5 years. The minimum frequency of observations is monthly. Where prices are available on a daily basis, the frequency shall be daily. Where prices are available on a weekly basis, the frequency shall be weekly. Where prices are available on a bi-monthly basis, the frequency shall be bi-monthly. Where data on daily prices covering a period of 5 years are not available, a shorter period may be used. For daily observations of a PRIIP's or its benchmark or proxy's price, there shall be at least 2 years of observed returns. For weekly observations of a PRIIP's price, there shall be at least 4 years of observed data. For monthly observations of a PRIIP's price, there shall be observed data covering a period of at least 5 years. The return over each period is defined as the natural logarithm of the ratio of the price at the market close at the end of the current period to the market close at the end of the preceding period. where ri is the return measured on the ith period in the history of returns. the volatility, σ, is given by . the skew, μ1, is equal to M3/σ3. the excess kurtosis, μ2, is equal to M4/σ4 – 3.
where T is the length of the recommended holding period in years. the VEV which is consistent with the risk limit of the fund, if any and appropriate. where investment policy has been revised during the period referred to in point 10 of this Annex, the VEV that shall be used is the highest of the VEVs referred to in point (a)(ii) and (iii). The PRIIP shall be assigned to a MRM class as laid down under point 2 of this Annex depending on the VEV. In the case of a PRIIP having only monthly price data, the MRM class assigned under point 2 of this Annex shall be increased by one additional class. The VaR in price space shall be calculated from a distribution of PRIIP values at the end of the recommended holding period. The distribution shall be obtained by simulating the price or prices, which determine the value of the PRIIP, at the end of the recommended holding period. The VaR shall be the value of the PRIIP at a confidence level of 97,5 % at the end of the recommended holding period discounted to the present date using the expected risk-free discount factor from the present date to the end of the recommended holding period. where T is the length of the recommended holding period in years. Only in cases where the product is called or cancelled before the end of the recommended holding period according to the simulation, the period in years until the call or cancellation is used in the calculation. The PRIIP shall be assigned to a MRM class as laid down in point 2 of this Annex, depending on the VEV. In the case of a PRIIP having only monthly price data, the MRM class assigned under point 2 of this Annex shall be increased by one additional class. The minimum number of simulations is 10 000. The simulation is based on bootstrapping the expected distribution of prices or price levels for the PRIIP's underlying contracts from the observed distribution of returns for these contracts with replacement. For the purposes of the simulation referred to in points 16 to 20 of this Annex, there are two types of market observables that may contribute to a PRIIP's value: spot prices (or price levels) and curves. σccy is the measured volatility of the Fx rate. calculate the price of each underlying contract by taking the exponential of the return. For curves, a principal component analysis (PCA) shall be performed to ensure that the simulation of the movements of each point on the curve over a long period results in a consistent curve. calculating the matrix of returns to be used in the simulation by multiplying the results in point (ix) with the transpose of the matrix of eigenvectors obtained in point (viii). This is the set of values to be used in the simulation. the time step in the simulation is one period. For each observation period in the recommended holding period select a row at random from the calculated matrix of returns. The return for each tenor point, T, is the sum over the selected rows of the column corresponding to tenor point, T.
adjusted so that the expected mean matches current expectations for the rate at tenor point T, at the end of the recommended holding period. For PRIIPS in Category 3 that are characterized by an unconditional protection of capital, the PRIIP manufacturer may assume that the VaR at a confidence level of 97,5 % is equal to the level of the unconditional capital protection at the end of the recommended holding period, discounted to the present date using the expected risk-free discount factor. Where the PRIIP performance depends on a factor or factors unobserved in the market or to some extent under the control of the PRIIP manufacturer, or this is the case for a component of the PRIIP, the PRIIP manufacturer shall follow the method in this section to account for this factor or factors. The different components of the PRIIP that contribute to the performance of the PRIIP shall be identified, in order for those components that are not wholly or partly dependent on a factor or factors that are unobserved in the market to be treated according to the relevant methods set out in this Annex for Category 1, 2 or 3 PRIIPs. For each of these components a VEV shall be calculated. The component of the PRIIP that depends wholly or partly on a factor or factors that are unobserved in the market shall follow robust and well recognised industry and regulatory standards for determining relevant expectations as to the future contribution of these factors and the uncertainty that may exist in respect of that contribution. Where the component is not wholly dependent on a factor that is unobserved in the market, a bootstrap methodology shall be used to account for the market factors, as set out for Category 3 PRIIPs. The VEV for the component of the PRIIP shall be the result of the combination of the bootstrap methodology and robust and well recognised industry and regulatory standards for determining relevant expectations as to the future contribution of these factors that are unobserved in the market. The VEV of each component of the PRIIP shall be weighted proportionally in order to arrive at an overall VEV of the PRIIP. When weighing the components, product features shall be taken into account. Where relevant, product algorithms mitigating the market risk as well as specificities of the with-profit component shall be considered. For Category 4 PRIIPs that are characterized by an unconditional protection of capital, the PRIIP manufacturer may assume that VaR at a confidence level of 97,5 % is equal to the level of unconditional capital protection at the end of the recommended holding period, discounted to the present date using the expected risk-free discount factor. A PRIIP or its underlying investments or exposures shall be taken to entail credit risk where the return of the PRIIP or its underlying investments or exposures depends on the creditworthiness of a manufacturer or party bound to make, directly or indirectly, relevant payments to the investor. A PRIIP with a MRM of 7 is not required to assess credit risk. Where an entity directly engages to make a payment to a retail investor for a PRIIP, credit risk shall be assessed for the entity that is the direct obligor. If all payment obligations of an obligor or one or more indirect obligors are unconditionally and irrevocably guaranteed by another entity (the guarantor), the credit risk assessment of the guarantor can be used if it is more favourable than the credit risk assessment of the respective obligor or obligors. For PRIIPs which are exposed to underlying investments or techniques, including PRIIPs which themselves entail credit risk or in turn make underlying investments that entail credit risk, the credit risk shall be assessed in relation to the credit risk entailed both by the PRIIP itself and the underlying investments or exposures (including exposures to other PRIIPs), on a look-through basis and adopting a cascade assessment where necessary. Where the credit risk is entailed solely at the level of underlying investments or exposures (including to other PRIIPs), the credit risk shall not be assessed at the level of the PRIIP itself but instead at the level of these underlying investments or exposures on a look-through basis. Where the PRIIP is an Undertaking for Collective Investment in Transferable Securities (UCITS) or an Alternative Investment Fund (AIF), the UCITS or AIF itself shall be taken to entail no credit risk, whereas the underlying investments or exposures of the UCITS or AIF shall be assessed where necessary. Where a PRIIP is exposed to multiple underlying investments entailing a credit risk exposure, the credit risk entailed by each underlying investment representing an exposure of 10 % or more of the total assets or value of the PRIIP shall be separately assessed. Underlying investments or exposures to exchange-traded derivatives or cleared OTC derivatives shall be assumed for the purposes of the credit risk assessment to carry no credit risk. No credit risk shall be taken to be entailed where an exposure is fully and appropriately collateralised, or where uncollateralised exposures that entail credit risk amount to less than 10 % of the total assets or value of the PRIIP. Where available, a PRIIP manufacturer shall define ex-ante one or more external credit assessment institutions (ECAI) certified or registered with the European Securities and Markets Authority (ESMA) in accordance with Regulation (EC) No 1060/2009 of the European Parliament and the Council (2) whose credit assessments will consistently be referred to for the purpose of the credit risk assessment. Where multiple credit assessments are available according to that policy, the median rating shall be used, defaulting to the lower of the two middle values in case of an even number of assessments. in the absence of a credit assessment under either (a) or (b) or both, a default credit assessment as set out in point 43 of this Annex. The allocation of credit assessments of ECAIs to an objective scale of credit quality steps shall be based on Commission Implementing Regulation (EU) 2016/1800 (3). In the case of credit risks assessed on a look-through basis, the credit quality step assigned shall correspond to the weighted average credit quality steps of each relevant obligor for which a credit assessment needs to be undertaken, in proportion to the total assets they respectively represent. In the case of credit risks assessed on a cascade basis, all credit risk exposures shall be separately assessed, per layer, and the credit quality step assigned shall be the highest credit quality step, being understood that between a credit quality step set at 1 and a credit quality step set at 3, the higher of the two is 3.
credit quality step 5, for any other obligor. A PRIIP shall be allocated to a credit risk measure (CRM) on a scale ranging from 1 to 6 on the basis of the mapping table laid down in point 45 of this Annex and by applying the credit risk mitigating factors under points 46, 47, 48 and 49 of this Annex, or the credit risk escalating factors under points 50 and 51 of this Annex, as appropriate. not, under any circumstances, accessible to any other creditors of the manufacturer under applicable law. such that the claims of retail investors have priority over the claims of other creditors of the PRIIP manufacturer or party bound to make, directly or indirectly, relevant payments to the investor. Where credit risk is to be assessed on a look-through or cascade basis, the mitigation factors under point 46 and 47 of this Annex may also be applied when assessing credit risk in relation to each underlying obligor. Where a PRIIP is not able to satisfy the criteria under point 47 of this Annex, the CRM pursuant to point 45 of this Annex may be reduced by one class where the claims of retail investors have priority over the claims of ordinary creditors, as set out in Article 108 of Directive 2014/59/EU, of the PRIIP manufacturer or party bound to make, directly or indirectly, relevant payments to the investor, in so far as the obligor is subject to relevant prudential requirements in respect of ensuring an appropriate matching of assets and liabilities. The CRM pursuant to point 45 of this Annex shall be increased by two classes where the claim of a retail investor is subordinate to the claims of senior creditors. The CRM pursuant to point 45 of this Annex shall be increased by three classes where a PRIIP is part of the own funds of the PRIIP obligor, as defined in Article 4(1)(118) of Regulation (EU) No 575/2013 of the European Parliament and of the Council (7) or in Article 93 of Directive 2009/138/EU. The PRIIP manufacturer shall monitor market data relevant to the calculation of the MRM class and, if the MRM class changes to a different MRM class, the PRIIP manufacturer shall attribute the corresponding MRM class to the MRM class which the PRIIP has matched for the majority of the reference points over the preceding four months. The PRIIP manufacturer shall also monitor credit risk criteria relevant to the calculation of the CRM and, if according to these criteria the CRM would change to a different CRM class, the PRIIP shall re-attribute the CRM to the relevant CRM class. A review of the MRM class shall always be carried out following a decision by the PRIIP manufacturer in respect of the PRIIP's investment policy and/or strategy. In those circumstances, any changes to the MRM shall be understood as a new determination of the PRIIP's MRM class, and consequently, be carried out according to the general rules concerning the determination of an MRM class for the PRIIP category. the PRIIP manufacturer estimates that the retail investor may face significant difficulties in terms of time or costs for disinvesting during the life of the product, subject to specific market conditions. the PRIIP does not offer potential early exit or redemption possibilities prior to the applicable maturity. A PRIIP shall be considered liquid in all other cases. (1) Directive 2014/65/EU of the European Parliament and of the Council of 15 May 2014 on markets in financial instruments and amending Directive 2002/92/EC and Directive 2011/61/EU (OJ L 173, 12.6.2014, p. 349). (2) Regulation (EC) No 1060/2009 of the European Parliament and of the Council of 16 September 2009 on credit rating agencies (OJ L 302, 17.11.2009, p. 1). (3) Commission Implementing Regulation (EU) 2016/1800 of 11 October 2016 laying down implementing technical standards with regard to the allocation of credit assessments of external credit assessment institutions to an objective scale of credit quality steps in accordance with Directive 2009/138/EC of the European Parliament and of the Council (OJ L 275, 12.10.2016, p. 19). (4) Directive 2011/61/EU of the European Parliament and of the Council of 8 June 2011 on Alternative Investment Fund Managers and amending Directives 2003/41/EC and 2009/65/EC and Regulations (EC) No 1060/2009 and (EU) No 1095/2010 (OJ L 174, 1.7.2011, p. 1). (5) Directive 2014/91/EU of the European Parliament and of the Council of 23 July 2014 amending Directive 2009/65/EC on the coordination of laws, regulations and administrative provisions relating to undertakings for collective investment in transferable securities (UCITS) as regards depositary functions, remuneration policies and sanctions (OJ L 257, 28.8.2014, p. 186). (6) Directive 2009/138/EC of the European Parliament and of the Council of 25 November 2009 on the taking-up and pursuit of the business of Insurance and Reinsurance (Solvency II) (OJ L 335, 17.12.2009, p. 1). (7) Regulation (EU) No 575/2013 of the European Parliament and of the Council of 26 June 2013 on prudential requirements for credit institutions and investment firms and amending Regulation (EU) No 648/2012 (OJ L 176, 27.6.2013, p. 1). PRIIP manufacturers shall use the format below for the presentation of the SRI in the key information document. The relevant number shall be highlighted as shown depending on the SRI for the PRIIP. The narrative explanation after the SRI shall briefly explain the purpose of the SRI and the underlying risks. where a PRIIP is considered to have a materially relevant liquidity risk or to be illiquid, whether this is contractual in nature or not. of the specific conditions of the limitations where the protection against credit risk is limited (Element J). For PRIIPs offering a range of options for investment, PRIIP manufacturers shall use the format referred to point 1 of this Annex for the presentation of the SRI, indicating all of the risk classes offered from the lowest risk class to the highest risk class. For derivatives that are futures, call options and put options traded on a regulated market or on a third-country market considered to be equivalent to a regulated market in accordance with Article 28 of Regulation (EU) No 600/2014, Elements A, B, and, where relevant, H, shall be included. 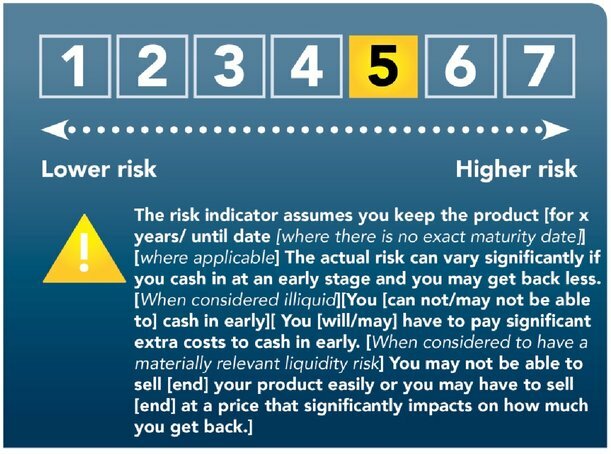 [Element A] The summary risk indicator is a guide to the level of risk of this product compared to other products. It shows how likely it is that the product will lose money because of movements in the markets or because we are not able to pay you. [Element B] We have classified this product as [1/2/3/4/5/6/7] out of 7, which is [1=‘the lowest’/2=‘a low’/3=‘a medium-low’/4=‘a medium’/5=‘a medium-high’/6=‘the second-highest’/7=‘the highest’] risk class. [An example explanation: This rates the potential losses from future performance at a [1=‘very low’/2=‘low’/3=‘medium-low’/4=‘medium’/5=‘medium-high’/6=‘high’/7=‘very high’] level, and poor market conditions [1, 2=‘are very unlikely to’/3=‘are unlikely to’/4=‘could’/5=‘will likely’/6=‘are very likely to’] impact [our] [the] capacity [of X] to pay you]. [[Where applicable:] Element C, in bold] Be aware of currency risk. You will receive payments in a different currency, so the final return you will get depend on the exchange rate between the two currencies. This risk is not considered in the indicator shown above. [[Where applicable:] Element D] In some circumstances you may be required to make further payments to pay for losses. (in bold) The total loss you may incur may significantly exceed the amount invested. [Where ongoing payments must be made] fail to make your payments in time. The stress scenario shall set out significant unfavourable impacts of the product not covered in the unfavourable scenario referred to in point 1(c) of this Annex. The stress scenario shall show intermediate periods where those periods would be shown for the performance scenarios under point 1(a) to (c) of this Annex. An additional scenario for insurance-based investment products shall be based on the moderate scenario referred to in point 1(b), where the performance is relevant in respect of the return of the investment. The scenario values under different performance scenarios shall be calculated in a similar manner as the market risk measure. The scenarios values shall be calculated for the recommended holding period. The unfavourable scenario shall be the value of the PRIIP at the 10th percentile. The moderate scenario shall be the value of the PRIIP at the 50th percentile. The favourable scenario shall be the value of the PRIIP value at the 90th percentile. The stress scenario shall be the value of the PRIIP that results from the methodology outlined in points 10 and 11 of this Annex for Category 2 PRIIPs and in points 12 and 13 of this Annex for Category 3 PRIIPs. where N is the number of trading periods in the recommended holding period, and where the other terms are defined in point 12 of Annex II. Identify for each sub interval of length w the historical lognormal returns rt, where t = t0, t1, t2, …, tN. Where Mw is the count of number of observations in the sub interval and is the mean of all the historical lognormal returns in the corresponding sub interval. where zα is a proper selected value of the PRIIP at the extreme percentile that corresponds to 1 % for 1 year and to 5 % for the other holding periods. the expected performance shall be calculated at the end of the recommended holding period, and without discounting the expected performance using the expected risk-free discount factor. where E*[rbootstrapped] is the new simulated mean. For Category 3 PRIIPs, the stress scenario shall be the value of the PRIIP at the extreme zα percentile as defined in point 11 of this Annex of the simulated distribution as set out in point 13 of this Annex. For Category 4 PRIIPs, the method under point 27 of Annex II shall be used in respect of those factors that are not observed in the market, combined as necessary with the method for Category 3 PRIIPs. The relevant methods for Category 2 PRIIPs set out in points 9 to 11 of this Annex and the relevant methods for Category 3 PRIIPs set out in points 12 to 14 of this Annex shall be used for the relevant components of the PRIIP where the PRIIP combines different components. The performance scenarios shall be a weighted average of the relevant components. Product features and capital guarantees shall be taken into consideration in the performance calculations. For Category 1 PRIIPs as defined in point 4(a) of Annex II, and Category 1 PRIIPs as defined in point 4(b) of Annex II that are not futures, call options and put options traded on a regulated market or on a third-country market considered to be equivalent to a regulated market in accordance with Article 28 of Regulation (EU) No 600/2014, performance scenarios shall be calculated in accordance with points 12 to 14 of this Annex. For Category 1 PRIIPs, that are futures, call options and put options traded on a regulated market or on a third-country market considered to be equivalent to a regulated market in accordance with Article 28 of Regulation (EU) No 600/2014, performance scenarios shall be shown in the form of pay-off structure graphs. A graph shall be included to show performance for all scenarios for the different levels of the underlying value. The horizontal axis of the graph shall show the various possible prices of the underlying value and the vertical axis shall show the profit or loss at the different prices of the underlying value. For every price of the underlying value, the graph shall show the resulting profit or loss and at which price of the underlying value the profit or loss shall be zero. For Category 1 PRIIPs as defined in point 4(c) of Annex II a reasonable and conservative best estimate of the expected values for the performance scenarios set out in point 1(a) to (c) of this Annex at the end of the recommended holding period shall be provided. The scenarios selected and shown shall be consistent with and complement the other information contained in the key information document, including the overall risk profile for the PRIIP. The PRIIP manufacturer shall ensure the consistency of the scenarios with internal product governance conclusions, including amongst other things, any stress-testing undertaken by the PRIIP manufacturer for the PRIIP, and data and analysis used for the purposes of producing the other information contained with the key information document. The scenarios shall be selected to give a balanced presentation of the possible outcomes of the product in both favourable and unfavourable conditions, but only scenarios that can be reasonably expected shall be shown. The scenarios shall not be selected so as give undue prominence to favourable outcomes at the expense of unfavourable ones. For PRIIPs with a recommended holding period between 1 and 3 years, performance shall be shown at 2 different holding periods: at the end of the first year and at the end of the recommended holding period. For PRIIPs with a recommended holding period of 3 years or more, performance shall be shown at 3 holding periods: at the end of the first year, after half the recommended holding period rounded up to the end of the nearest year, and at the end of the recommended holding period. For PRIIPs with a recommended holding period of 1 year or less, no performance scenarios for intermediate holding periods shall be shown. For Category 2 PRIIPs, the values to be shown for the intermediate periods shall be calculated using the formulas in point 9 to 11 of this Annex with the N defined to be the number of trading periods from the start date to the end of the intermediate period. For Category 1 PRIIPs and Category 4 PRIIPs, the values to be shown for the intermediate periods shall be estimated by the PRIIP manufacturer in a manner consistent with the estimation at the end of the recommended holding period. To this end, the method used to estimate the value of the PRIIP at the start of each intermediate period needs to produce the same value for the entire recommended holding period, as under the method prescribed in points 16 and 15 of this Annex respectively. For Category 3 PRIIPs, to produce the favourable, moderate, unfavourable and stress scenarios at an intermediate period before the end of the recommended holding period, the manufacturer shall pick three underlying simulations as referred to in points 16 to 24 of Annex II used for the calculation of the MRM and one underlying simulation as referred to in point 13 of this Annex, on the basis of underlying levels only and in such a manner that the simulated value of the PRIIPs for that intermediate period is likely to be consistent with the relevant scenario. To produce the favourable, moderate, unfavourable and stress scenarios at an intermediate period for a Category 3 PRIIP with one underlying and whose value is known to be a increasing function of its underlying level, the manufacturer shall pick three underlying simulations as referred to in points 16 to 24 of Annex II used for the calculation of the MRM and one underlying simulation as referred to in point 13 of this Annex, leading respectively to the 90th percentile level for the favourable scenario, the 50th percentile level for the moderate scenario, the 10th percentile level for the unfavourable scenario and the percentile level that corresponds to 1 % for 1 year and to 5 % for the other holding periods for the stress scenario. To produce the favourable, moderate, unfavourable and stress scenarios at an intermediate period for a Category 3 PRIIP with one underlying and whose value is known to be an decreasing function of its underlying level, the manufacturer shall pick three underlying simulations as referred to in points 16 to 24 of Annex II used for the calculation of the MRM and one underlying simulation as referred to in point 13 of this Annex, leading respectively to the 90 the percentile level for the unfavourable scenario, the 50th percentile level for the moderate scenario, the 10th percentile level for the favourable scenario and the percentile level that corresponds to 1 % for 1 year and to 5 % for the other holding periods for the stress scenario. To produce the favourable, moderate, unfavourable and stress scenarios at an intermediate period for a Category 3 PRIIP other than those mentioned in points (a) and (b) the manufacturer shall choose underlying values consistent with the 90th, the 50th, and the 10th percentile levels and the percentile level that corresponds to 1 % for 1 year and to 5 % for the other holding periods of the PRIIP and use these values as the seed values for a simulation to determine the value of the PRIIP. For Category 1 PRIIPs that are futures, call options and put options traded on a regulated market or on a third-country market considered to be equivalent to a regulated market in accordance with Article 28 of Regulation (EU) No 600/2014, performance scenarios for intermediate holding periods shall not be included. For favourable, moderate and unfavourable scenarios at intermediate periods, the estimate of the distribution used to read the value of the PRIIP at different percentiles shall be consistent with the observed return and volatility observed over the past 5 years of all market instruments that determine the PRIIP's value. For the stress scenario at intermediate periods, the estimate of the distribution used to read the value of the PRIIP at different percentiles shall be consistent with the simulated distribution of all market instruments that determine the PRIIP's value as set out in points 11 and 13. The unfavourable scenario shall be the estimate of the value of the PRIIP at the start of the intermediate period consistent with the 10th percentile. The moderate scenario shall be the estimate of the value of the PRIIP at the start of the intermediate period consistent with the 50th percentile. The favourable scenario shall be the estimate of the value of the PRIIP at the start of the intermediate period consistent with the 90th percentile. The stress scenario shall be the estimate of the value of the PRIIP at the start of the intermediate period consistent with the percentile level that corresponds to 1 % for 1 year and to 5 % for the other holding periods of the simulated distribution as set out in point 13. The performance of the PRIIP shall be calculated net of all applicable costs in accordance with Annex VI for the scenario and holding period being presented. Performance shall be presented in monetary units. The amounts used shall be consistent with the amounts referred to in point 90 of Annex VI. Performance shall also be presented in percentage terms, as the average annual return of the investment. That figure shall be calculated considering net performance as numerator and the initial investment amount or the price paid as denominator. For those PRIIPs where there is no initial investment or price paid such as future contracts or swaps, the percentage shall be calculated considering the nominal value of the contract and a footnote shall be added to explain that calculation. the performance scenarios shall be calculated on the basis of the investment amounts set out in point 32 of this Annex. The performance scenarios shall be presented in a way that is fair, accurate, clear and not misleading, and that is likely to be understood by the average retail investor. Where performance scenarios may be shown only at maturity or at the end of the recommended holding period, as for the PRIIPs referred to in point 21 of Annex IV, that shall be clearly explained in the narrative set out in element E in Part 2 of this Annex. In all cases, the narrative explanations set out in elements A, B, C, D and F in Part 2 of this Annex shall be included, except in the case of Category 1 PRIIPs referred to in point 17 of Annex IV, where the narrative explanations set in elements G to K shall be used instead. For all PRIIPs except for category 1 PRIIPs referred to in point 17 of Annex IV, PRIIP manufacturers shall present the performance scenarios by means of the formats below, depending on whether the PRIIP is a single investment or premium or a regular payment or premium PRIIP. The interim periods may differ depending on the length of the recommended holding period. For insurance-based investment products additional rows are included in respect of the scenario for the insurance benefits including the cumulative biometric risk premium for a regular premium insurance-based investment product. Returns for that scenario shall only be shown in absolute values. Template A: Single investment and/or single premium is paid. Template B: Regular investments and/or premiums are paid. [Element A] This [table/graph] shows the money you could get back over the next [recommended holding period] years, under different scenarios, assuming that you invest EUR […] [per year]. [Element B] The scenarios shown illustrate how your investment could perform. You can compare them with the scenarios of other products. [Element C] The scenarios presented are an estimate of future performance based on evidence from the past on how the value of this investment varies, and are not an exact indicator. What you get will vary depending on how the market performs and how long you keep the investment/product. [Element D] The stress scenario shows what you might get back in extreme market circumstances, and it does not take into account the situation where we are not able to pay you. [Where applicable][Element E] This product cannot be [easily] cashed in. This means it is difficult to estimate how much you would get back if you cash in before [the end of the recommended holding period/maturity]. You will either be unable to cash in early or you will have to pay high costs or make a large loss if you do so. [Element F] The figures shown include all the costs of the product itself, [where applicable]:[but may not include all the costs that you pay to your advisor or distributor][and includes the costs of your advisor or distributor]. The figures do not take into account your personal tax situation, which may also affect how much you get back. [Element G] This graph illustrates how your investment could perform. You can compare them with the pay-off graphs of other derivatives. [Element H] The graph presented gives a range of possible outcomes and is not an exact indication of what you might get back. What you get will vary depending on how the underlying will develop. For each value of the underlying, the graph shows what the profit or loss of the product would be. The horizontal axis shows the various possible prices of the underlying value on the expiry date and the vertical axis shows the profit or loss. [Element I] Buying this product holds that you think the underlying price will [increase/decrease]. [Element J] Your maximum loss would be that you will lose all your investment (premium paid). [Element K] The figures shown include all the costs of the product itself, but may not include all the costs that you pay to your advisor or distributor. The figures do not take into account your personal tax situation, which may also affect how much you get back. deducted from a payment received by or due to the retail investor. One-off costs are costs borne by the retail investor that are not deducted from the assets of the AIF or UCITS. dividends served by the shares held in the portfolio of the funds, shall the dividends not accrue to the fund. carried interests as referred to in point 25 of this Annex. Transaction costs shall be calculated on an annualised basis, based on an average of the transaction costs incurred by the PRIIP over the previous three years. Where the PRIIP has been operating for less than three years, transaction costs shall be calculated using the methodology set out in point 21 of this Annex. The aggregate transaction costs for a PRIIP shall be calculated as the sum of the transaction costs as calculated in accordance with points 9 to 23 of this Annex in the base currency of the PRIIP for all individual transactions undertaken by the PRIIP in the specified period. This sum shall be converted into a percentage by dividing by the average net assets of the PRIIP over the same period. other instruments that there are frequent opportunities to dispose of, redeem, or otherwise realise at prices that are publicly available to market participants and that are either market prices or prices made available, or validated, by valuation systems independent of the issuer. Estimates of transaction costs using the methodology described below in points 19 to 20 of this Annex must be used for investments in other instruments or assets. the difference between the price of units cancelled and the mid-price, multiplied by the net number of units cancelled. for each sale undertaken by the PRIIP, the net realised execution price of the transaction shall be subtracted from the price of the instrument at the time the order to sell is transmitted to another person for execution (the sale ‘arrival price’). The resulting value shall be multiplied by the number of units sold. The net realised execution price shall be determined as the price at which the transaction is executed, including all charges, commissions, taxes and other payments (such as anti-dilution levies) associated with the transaction, either directly or indirectly, where those payments are made from the assets of the PRIIP. The arrival price shall be determined as the mid-market price of the investment at the time when the order to transact is transmitted to another person. For orders that are transacted on a day that is not the day that the order was originally transmitted to another person, the arrival price shall be determined as the opening price of the investment on the day of the transaction or, where the opening price is not available, the previous closing price. Where a price is not available at the time when the order to transact is transmitted to another person (due to the order initiated outside market opening hours or in over-the-counter markets where there is no transparency of intra-day prices for example), the arrival price shall be determined as the opening price on the day of the transaction or, where the opening price is not available, the previous closing price. Where an order is executed without being transmitted to another person, the arrival price shall be determined as the mid-market price of the investment at the time when the transaction was executed. Where information about the time when the order to transact is transmitted to another person is not available (or not available to a sufficient level of accuracy), or where information about the price at that time is not available, it is permissible to use as the arrival price the opening price of the investment on the day of the transaction or, where the opening price is not available, the previous closing price. When calculating transaction costs using data prior to 31 December 2017, intra-day prices may be considered as not available. for non-linear instruments, it is permissible to calculate the transaction costs as the difference between the price paid or received for the instruments and the fair value of the instrument, on the basis described in points 36 to 46 of this Annex. In calculating the costs associated with foreign exchange, the arrival price must reflect a reasonable estimate of the consolidated price, and must not simply be the price available from a single counterparty or foreign exchange platform, even if an agreement exists to undertake all foreign exchange transactions with a single counterparty. In calculating the costs associated with orders that are initially entered into an auction, the arrival price shall be calculated as the mid-price immediately prior to the auction. where a previous independent valuation price is not available, the transaction costs must be estimated based on the difference between the transaction price and an appraisal of the fair value of the asset prior to purchase. The transaction cost estimate must not be less than the amount of actual identifiable costs directly associated with the transaction. For the asset classes indicated in the table below, transaction costs shall be calculated as the average of the estimated cost of transaction (based on bid-ask spreads divided by two) for the relevant asset class under normal market conditions. To estimate the cost, one or more reference indexes shall be identified for each asset class. Then, the average bid-ask spreads of the underlying indexes shall be collected. The data collected shall refer to the closing bid-ask spread at the tenth business day of each month during the last year. The bid-ask spreads collected shall then be divided by two to obtain the estimated cost of transaction for each point in time. The average of those values is the estimated cost of transaction in each asset class under normal market conditions. For the asset classes indicated in the table below, transaction costs (including explicit costs and implicit costs) shall be estimated either by using comparable information or by adding estimates of explicit costs to estimates of half the bid-ask spread, using the methodology described in point (i). For the asset classes indicated in the table below, the transaction cost is the average of the observed cost of transaction (based on bid-ask spreads divided by two) in this asset class under normal market conditions. When identifying the observed cost of transaction, results of a panel survey may be taken into account. Estimates of portfolio turnover for a PRIIP that has been operating for less than one year must be made on a consistent basis with the investment policy disclosed in the offering documents. Estimates of portfolio turnover for a PRIIP that has been operating for more than one year must be consistent with actual portfolio turnover. For PRIIPs that have been operating for less than three years and that invest predominantly in assets other than assets as referred to in point 9 of this Annex, the PRIIP manufacturer shall estimate the transaction costs on the basis of the fair value method using comparable assets. compute the performance fees using the methodology referred to in point (a) (average of annual performance fees). for new funds, their return shall be estimated using the return of a comparable fund or of a peer group. The estimated return shall be gross of all the costs charged to the new fund. Therefore peer group's returns need to be adjusted by adding the average relevant costs charged according to the rules of the new fund. For instance, in case of a new class with a different fee structure, the returns of this new class shall be adjusted taking into account the costs of the existing class. compute the carried interests using the methodology referred to in point (a) (average of annual carried interests). If no carried interests are taken throughout the investment, a warning needs to accompany the indication of zero carried interests in the composition of costs table in order to clarify that a payment of x % of the final return shall take place subsequently to the exit of the investment. A one-off cost is an entry and exit cost which include initial charges, commissions or any other amount paid directly by the retail investor or deducted from a payment received by or due to the retail investor. One-off costs are borne by a PRIP other than an investment fund, whether they represent expenses necessarily incurred in its operation, or the remuneration of any party connected with it or providing services to it. implicit premium paid to the issuer. CFD trading such as bid-ask spreads, daily and overnight financing costs, account management fees and taxes which are not already included in the fair value. Recurring costs are payments regularly deducted from all payments due to the retail investor or from the amount invested. Recurring costs include all types of cost borne by a PRIP other than an investment fund whether they represent expenses necessarily incurred in its operation, or the remuneration of any party connected with it or providing services to it. costs of the underlying, if any. One-off exit costs and charges are exchange fees, clearing fees and settlement fees where known. Recurring costs are hedging costs borne under normal market conditions and stressed market conditions. For the purposes of the calculation of the implicit costs embedded in PRIPs, the PRIIP manufacturer shall refer to the issue price and, after the subscription period, to the price available to purchase the product on a secondary market. The difference between the price and the fair value of the product is considered as an estimation of the total entry costs included in the price. If the PRIIP manufacturer is unable to distinguish the relevant implicit costs to be disclosed as referred to in point 29 of this Annex using the difference between the price and the fair value, it shall liaise with the issuer of the different components of the product, or the relevant body, in order to gather the relevant information on those costs. Fair value is the price that would be received to sell an asset or paid to transfer a liability in an orderly transaction in the principal (or most advantageous) market at the measurement date under current market conditions (i.e. an exit price) regardless of whether that price is directly observable or estimated using another valuation technique. methodology for the calculation of the fair value. maximises the use of relevant observable market inputs and minimizes the use of unobservable inputs. internal pricing models based on inputs which are not derived directly from market data for which estimations and assumptions must be formulated (mark-to-model approach). If the fair value cannot be derived from market prices, it shall be calculated using a valuation technique that is able to represent properly the different factors affecting the product payoff structure making maximum use of market data. the use of an appropriate discounted cash-flow model where the likelihood of each cash flow is determined using an appropriate model of asset price evolution. In the case of subscription products, the fair value shall be calculated on the date when the product terms are determined. This valuation date shall be close to the beginning of the subscription period. Where long offering periods or high market volatility exists, a criterion to update cost information shall be defined. Where preliminary terms are used, costs shall be calculated by using the minimum terms of the product. Where variable subscription prices are used, a procedure on how to incorporate and disclose the cost effect of the varying subscription price shall be defined. A one-off cost is an entry and exit cost which includes initial charges, commissions or any other amount paid directly by the retail investor or deducted from the first payment or from a limited number of payments due to the retail investor or from a payment upon redemption or termination of the product. One-off costs are borne by an insurance-based investment product, whether they represent expenses necessarily incurred in its operation, or the remuneration of any party connected with it or providing services to it. costs of holding required capital (up front part to be disclosed insofar as they are charged). Recurring costs are payments regularly deducted from all payments from the retail investor or from the amount invested or amounts that are not allocated to the retail investor according to a profit sharing mechanism. The recurring costs include all types of costs borne by an insurance-based investment product whether they represent expenses necessarily incurred in its operation, or the remuneration of any party connected with it or providing services to it. payments to third parties to meet costs necessarily incurred in connection with the acquisition or disposal of any asset owned by the insurance-based investment product (including transaction costs as referred to in points 7 to 23 of this Annex). Where an insurance-based investment product invests a part of its assets in UCITS or AIFs, in a PRIIP other than UCITS or AIFs or in an investment product other than a PRIIP, points 5(l), 5(m) and 5(n) of this Annex shall be applied respectively. Biometric risk premiums are those premiums paid directly by the retail investor or deducted from the amounts credited to the mathematical provision or from the participation bonus of the insurance policy, that are intended to cover the statistical risk of benefit payments from insurance coverage. other payoffs related to insurance cover (rebates on biometric risk premiums paid back to the the retail investors, increase of benefit payments, reduction of future premiums, etc.) resulting from profit sharing mechanisms (legal and/or contractual). 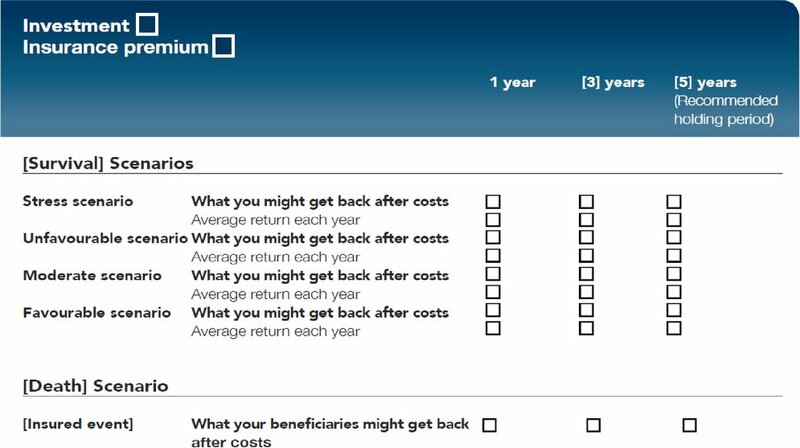 Best estimate assumptions on future benefit payments from insurance coverage shall be set in a realistic way. The estimated future benefit payments shall not include prudency margins or costs for the management of the insurance cover. For manufacturers within the scope of Directive 2009/138/EC these best estimate assumptions shall be consistent with the respective assumptions used for the calculation of the technical provisions in the Solvency II balance sheet. The cost part of biometric risk premiums is the difference between biometric risk premiums charged to the retail investor referred to in point 54 of this Annex and the fair value of the biometric risk premiums referred to in point 55 of this Annex. A PRIIP manufacturer may include the full biometric risk premiums in the calculation of one-off costs or recurring costs in the place of the cost part of those premiums. The summary cost indicator of the PRIIP is the reduction of the yield due to total costs calculated in accordance with points 70 to 72 of this Annex. For the calculation of the summary cost indicator the costs to be disclosed referred to in point 72 of this Annex shall be the total costs. This shall equal for investment funds the sum of the costs as referred to in points 1 and 2 of this Annex plus the sum of the costs as referred to in points 4 and 6 of this Annex; for PRIPs other than investment funds, except PRIIPs referred in point 17 of Annex IV, the sum of the costs as referred to in points 27 and 28 of this Annex plus the sum of the costs as referred to in points 31 and 32 of this Annex; for PRIIPs referred to in point 17 of Annex IV, the sum of the costs as referred to in points 34 and 35 of this Annex; and for insurance-based investment products, the sum of the costs as referred to in points 47 and 48 plus the sum of the costs as referred to in points 50 and 51 of this Annex. The total costs shall also include exit penalties, where relevant. The entry and exit costs ratio of the PRIIP shall be the reduction of the annual yield due to entry and exit costs calculated according to points 70 to 72 of this Annex. For the calculation of the entry and exit costs ratio the costs to be disclosed referred to in point 72 of this Annex shall for investments funds be the entry and exit costs according to points 1 and 2 of this Annex; points 27 and 28 of this Annex for PRIPs other than investment funds, except PRIIPs referred in point 17 of Annex IV; point 35 for PRIIPs referred in point 17 of Annex IV; and points 47 and 48 of this Annex for insurance-based investment products. Exit costs shall also include exit penalties, where relevant. The portfolio transaction costs, insurance costs and other recurring costs ratio of the PRIIP shall be the reduction of the annual yield due to portfolio transaction costs and other recurring costs calculated according to points 70 to 72 of this Annex. for the calculation of the insurance costs ratio, the costs to be disclosed referred to in point 72 of this Annex shall be the insurance costs according to points 59 and 60 of this Annex for insurance based investment products. The other recurring costs ratio shall be the reduction of the annual yield due to other recurring costs that is calculated as the difference between the summary cost indicator according to point 61 of this Annex and the sum of the one-off costs ratio, according to point 63 of this Annex, plus portfolio transaction costs ratio, according to point 66(a), plus insurance costs ratio, according to point 66(b) of this Annex, plus the incidental costs ratios, according to point 68 of this Annex. For the calculation of the performance fees ratio, the cost to be disclosed referred to in point 72 shall be the portfolio incidental costs according to point 6(a) of this Annex for investment funds. For the calculation of the carried interests ratio, the cost to be disclosed referred to in point 72 of this Annex shall be the portfolio incidental costs according to point 6(b) of this Annex for investment funds. The ‘ongoing costs’, ‘performance fees’ and ‘carried interests’ as referred to in Annex VII are respectively the ‘recurring costs’, ‘performance fees ratio’ and ‘carried interests ratio’ as referred to in this Annex and in Article 5. The summary cost indicator shall be calculated as the difference between two percentages i and r where r is the annual internal rate of return in relation to gross payments by the retail investor and estimated benefit payments to the retail investor during the recommended holding period and i is the annual internal rate of return for the respective cost free scenario. for PRIIPs as referred to in point 17 of Annex IV and for UCITS or non-UCITS funds for which PRIIP manufacturers use the key investor information document in accordance with Article 14(2) of this Regulation, the performance shall be 3 %. where costs to be disclosed can be expressed as a constant percentage of the value of the assets they may be disregarded in the calculation described in point 72(a) of this Annex and instead be added to the percentage of the annual internal rate of return i for the respective cost free scenario afterwards. For the purpose of the calculation of the cost free scenario as referred to in point 70 of this Annex for PRIPs other than investment funds, gross payments by the retail investor from the calculation of r, as referred to in point 72 of this Annex, shall be reduced by the costs to be disclosed. For the purpose of the calculations described in points 70 to 72 of this Annex, it shall be assumed that, for insurance-based investment products, no payments resulting from insurance coverage occur during the holding period. That is to say, the calculation of the summary cost indicator shall be solely based on estimated endowment benefit payments. To the extent recurring and one-off costs are covered by explicit costs that are a fixed part of the premium calculation of the product the calculation of recurring and one-off costs shall be based on these explicit costs. that the cost bonuses are declared separately from other parts of the participation bonus and are intended for refunding parts of the costs by the contractual terms of the product. that the PRIIP manufacturer can substantiate on the basis of sound actuarial methods that expected future cost bonuses are covered by expected future profits that result from prudent assumptions on future costs. If one type of cost is covered by two or more types of costs as referred to in this Annex, that type of cost shall only be accounted for once in the calculation of the indicators (ratios) which are based on it. The ratios shall be expressed as a percentage to two decimal places. The ratios shall be calculated at least once a year. The ratios shall be based on the most recent cost calculations which the PRIIP manufacturer has determined. Without prejudice to point 77 of this Annex, the costs are assessed on an ‘all taxes included’ basis. in the case of a fund which is an umbrella, each constituent compartment or sub-fund shall be treated separately for the purpose of this Annex, but any charges attributable to the fund as a whole shall be apportioned among all of the sub-funds on a basis that is fair to all investors. Apart from the first calculation for a new PRIIP, and if not stated otherwise, the ratios shall be calculated at least once a year, on an ex-post basis. Where it is considered unsuitable to use the ex-post figure because of a material change, an estimate may be used instead until reliable ex-post figures reflecting the impact of the material change become available. The ex-post figures shall be based on recent cost calculations which the PRIIP manufacturer has determined on reasonable grounds to be appropriate for that purpose. The figures may be based on the costs set out in the PRIIP's statement of operations published in its latest annual or half-yearly report, if that statement is sufficiently recent. It it is not sufficiently recent, a comparable calculation based on the costs charged during a more recent 12-month period shall be used instead. Information about the ratios that were applicable during previous years/periods shall be published at the location which is specified in the key information document as the general source of further information for investors who require it. all the pro-rated figures shall be added to the total cost figure of the investing PRIIP itself, thus presenting a single total. In place of ex-post data, estimates shall be used in the calculation of the different types of costs. Such estimates shall be carried out by adopting as proxies either a comparable PRIIP or a peer group. For PRIIPs which charge a fixed all-inclusive fee, that fee shall be used provided it includes all costs to be presented under the PRIIPs cost disclosure requirements. For PRIIPs which set a cap or maximum on the amount that can be charged, and provided it includes all costs to be presented under the PRIIPs cost disclosure requirements, that cap or maximum shall be used instead so long as the PRIIP manufacturer gives a commitment to respect the published figure and to absorb any costs that would otherwise cause it to be exceeded. If, in the PRIIP manufacturer's opinion, expressing a figure to two decimal places would be likely to suggest a spurious degree of accuracy to investors, it shall be sufficient to express that figure to one decimal place. The PRIIP manufacturer shall ensure that the accuracy of the estimated figure is kept under review. The PRIIP manufacturer shall determine when it is appropriate to begin using ex-post figures rather than an estimate; but in any case it shall, no later than 12 months after the date on which the PRIIP was first offered for sale in any Member State, review the accuracy of the estimate by calculating a figure on an ex-post basis. The table(s) referred to in Article 5 shall contain an indication of the total costs in monetary and percentage terms for the case that the retail investor invests, respectively 10 000 EUR (for all PRIIPs except regular premium insurance-based investment products), or 1 000 EUR yearly (for regular premium insurance-based investment products) during different holding periods, including the recommended holding period. The holding periods to be shown are those referred to in points 14 to 16 of Annex IV. Where a product is considered not to have an alternative liquidity facility promoted by the PRIIP manufacturer or a third party, or where there is an absence of liquidity arrangements, or for those PRIIPs as referred to in point 17 of Annex IV, that indication of costs may be shown only at maturity or at the end of the recommended holding period. Where the currency of the PRIIP is not in Euros, an amount of a similar magnitude to those set out in point 90 of this Annex and which is cleanly divisible by 1 000 shall be used. The total costs shall include one-off, recurring and incidental costs, and, where relevant, exit penalties. Exit penalties are to be distinguished from other exit costs which have to be paid in any case and therefore always need to be included in the one-off costs. The relevance of exit penalties depends on the holding period of the investment and the exact moment when the product is cashed in. Exit penalties are not relevant if the investment is kept for the recommended holding period. (1) Commission Directive 2007/16/EC of 19 March 2007 implementing Council Directive 85/611/EEC on the coordination of laws, regulations and administrative provisions relating to undertakings for collective investment in transferable securities (UCITS) as regards the clarification of certain definitions (OJ L 79, 20.3.2007, p. 11). The Reduction in Yield (RIY) shows what impact the total costs you pay will have on the investment return you might get. The total costs take into account one-off, ongoing and incidental costs. The amounts shown here are the cumulative costs of the product itself, for three different holding periods. They include potential early exit penalties. The figures assume you invest [EUR 10 000 (OR EUR 1 000 each year for regular premium PRIIPs)]. The figures are estimates and may change in the future. The person selling you or advising you about this product may charge you other costs. If so, this person will provide you with information about these costs, and show you the impact that all costs will have on your investment over time. the meaning of the different cost categories. For PRIIPs offering a range of options for investment, PRIIP manufacturers shall use the table 1 and table 2 of this Annex for the presentation of the costs, showing for each of the figures in each table, as relevant, the range of the costs.